Excellent research is at the heart of the Sainsbury Institute’s mission, and we are always looking for ways in which to most effectively disseminate the results of that research, in particular to new audiences we have not yet been able to reach. We are also very interested in engaging with and encouraging new generations of Japan afficianados. With this in mind, in early February we will launch a new English-language Online Resource for Japanese Archaeology and Cultural Heritage (ORJACH). Aimed primarily at students from 14-18 in secondary education, the responses we have had to various previews suggests that ORJACH may well be of much wider interest than we initially anticipated. The project grew out of discussions with our sponsors for this initiative, Hitachi of Europe plc and Hitachi Solutions plc. Mami Mizutori and I were invited to their headquarters near Reading, and it soon became apparent that something web-based to encourage greater awareness of Japanese cultural heritage would make a very interesting collaboration. We were fortunate to secure the services of Don Henson as consultant to the project. Don has unparalleled experience of bringing archaeology and cultural heritage to the classroom. He worked for many years as the Head of Education at the Council for British Archaeology, before starting a PhD on the public perception of the Mesolithic (the period in European prehistory which most closely accords with the earlier parts of the Jomon period in Japan). Among many other roles, he is also Honorary Director of CASPAR, the Centre for Audio-Visual Practice in Archaeology at UCL. We then needed to find the right person to develop the content for the Resource. Again we were lucky, in that our former Handa Jomon Archaeology Fellow at the Sainsbury Institute, Nakamura Oki, was just completing a major project, an exhibition called Dogu: a Cosmos at the Miho Museum in Japan, and was wondering what to do next. Over coffee at the New Miyako Hotel in Kyoto, Mami and I explained to Oki what we hoped to achieve. 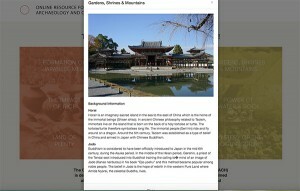 Despite some clear challenges (not least that no such thing had ever been attempted before – even in Japan, where although archaeology is mentioned in school textbooks, it tends to be limited to about half a page), Oki immediately recognised the potential significance of what was being proposed. He threw himself wholeheartedly into first developing a clear structure for the resource and then producing a number of carefully-crafted modules around three main strands: food, environment and belief. We were aware, of course, that archaeology and cultural heritage do not figure highly in most secondary school curricula, so we felt that themes like this, and the modular approach we have adopted, would allow teachers of many different subject areas to use the Resource in their classrooms. Before we embarked on detailed work on the content, we convened a special workshop at the august Society of Antiquaries of London, with an invited audience of teachers. Don had already established a focus group of teachers from around the UK, and the full day of intensive presentations and discussions helped us develop a framework for the Resource based on the suggestions of the teachers. The following year was spent writing the content, deciding on images and securing the permissions to use the pictures Oki had painstakingly selected from the many thousands of possibilities. Most of the copyright holders, including many archaeology centres, museums and even temples and shrines, did not have experience with online publishing, and securing these permissions became an immense task. In May, Oki gave a presentation about the Resource to the Annual Meeting of the Japanese Archaeological Association, which has its own Education Committee, who expressed great interest in the project. By mid 2014, much was in place. The website was designed by Language Brand Communication, a young, enthusiastic and exceptionally capably company based in Manchester led by Ben Hui. We were ready to try the Resource out. All we needed were some willing guinea pigs. Again, fate looked kindly on us. As part of a different project, we are connecting up the ancient town of Thetford, some 30 miles southwest of Norwich, home to the remarkable Grimes’ Graves Neolithic flint mines, with the tiny municipality of Nagawa, which sits atop the Yatsugatake volcanic massif in central Honshu, home to a series of very important obsidian mines. 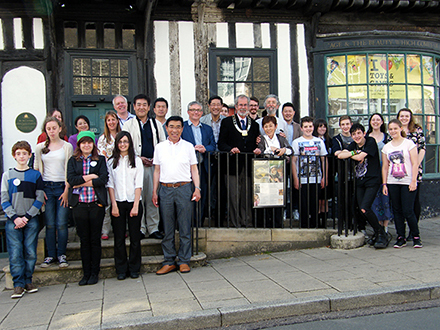 A delegation from Nagawa happened to be visiting Norwich in early June, and were treated to a special introduction to the Ancient House Museum in Thetford by members of the Teenage History Club there, run by the museum’s education officer, Melissa Hawker. In return for their hospitality and enthusiasm, we gave them a private preview of the Resource in the presence of local dignitaries from Thetford and Nagawa. Judging from the reaction of the Teenage History Club, we had a success on our hands. It remains to be seen how the Resource will be taken up. Don Henson has researched relevant courses and curricula around the English-speaking world, which we are in the process of looking into further. We are also aware of considerable interest among Japanese universities, looking to further internationalise themselves, and with a voracious appetite for resources about Japan in English. We are currently working with teachers to develop some model lesson plans using the Resource. And we will be presenting ORJACH at the Teachers’ event at the Sainsbury Centre for Visual Arts on February 10th. Why not check out the Resource yourself: it will be publically available from early February at www.orjach.org. We would welcome your feedback. We hope that this represents the type of project that will be of interest to other potential sponsors in the future.